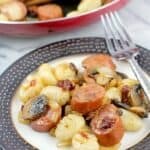 Smoked sausage cooked up with onion, mushrooms, garlic, sun-dried tomatoes, and lots of Cajun seasoning, then served with super easy gnocchi. Heat a large nonstick skillet on high heat. Add 1 tablespoon of butter and the mushrooms, and cook, tossing occasionally, until browned and yummy. Transfer to a plate. In the same skillet, heat the remaining tablespoon butter. Add the smoked sausage and cook until very lightly browned. Add the garlic and onion, and cook until onion is translucent but not overly soft (we want the onion to retain some texture). Add back the mushrooms to the skillet with the smoked sausage mixture. Add the sun-dried tomatoes, Cajun seasoning, and pepper. Remove from the heat. Add the gnocchi to the pot of boiling water. Gnocchi float when they are ready (and this occurs inside of 3 minutes), so simply scoop them out and transfer to the smoked sausage mixture in the skillet as they rise to the surface. Toss the cooked gnocchi into the smoked sausage mixture. Serve. Yields 4-5 servings. Once the Cajun seasoning is added, the smoked sausage mixture will be quite salty, but that salt will be taken up by the gnocchi. So, wait until the recipe is fully prepared to judge and taste for seasoning.